When Robert and Heather Wood started Mountainwood Homes, a residential design/build firm, in 2008, their goal was an ambitious one: to establish client relationships that endured. To do this, they put their strengths into action—Heather as an award-winning interior designer, Robert as a Certified Master Builder. Eight years later, the Beaverton-based business that began humbly employs 24 people and has a reputation for providing extraordinary client care and attending to every last design detail. Heather knows that contemplating a remodeling job or new home build can be daunting, and she and her team go to remarkable lengths to make it as stress-free as possible. HOW DOES YOUR HANDSON APPROACH WORK? Our team does a lot of listening up front. Our goal is to help articulate people’s ideas through good design— incorporating their personal style as well as their history and plans for the future. Homeowners have their own professional interior designer dedicated to their project. We guide them through all the decisions with their budget and needs in mind. Our clients are in the hands of experts all along the way, from sales to design and construction. We can solve any problem that arises; several of our project managers are Certified Master Builders. Designers also remain in the picture once construction begins; we visit showroom warehouses to double-check that material quantities are correct and swing by the job sites if questions or concerns arise. Homeowners have access to our cloud-based software so they can follow along with the progress of their project, even while at work or on vacation. WHAT WERE SOME OF YOUR RECENT DESIGN CHALLENGES? A client in northeast Portland wanted a second-story integrated master suite bathroom that carried through the authentic 1920s vintage of the home. The existing upper floor had to be brought up to code. We added a shed-style dormer to the back of the house and created a tranquil new bath space with a walk-in shower, subway and hexagon tiles and fresh white built-in cabinetry that feels right at home in its historic surroundings. A Bethany kitchen remodel included an awkward existing structural post. Adhering to our clients’ budget, rather than removing it and installing a beam, we gave the column a purpose. We designed an oversize island, and the column was transformed into a beautiful structural element that blends seamlessly into the updated space. 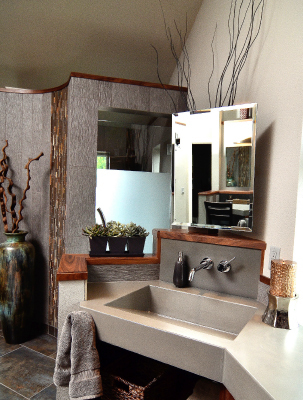 The curved shower wall and his-and-her concrete sink vanities provide contemporary flair. WHAT ARE SOME OF THE MOST INTERESTING DESIGN TRENDS YOU’VE BEEN SEEING LATELY? About six years ago, white kitchens and bathrooms began popping up everywhere. In 2016, we’re still seeing them, but I’m starting to notice warm wood elements being incorporated into those rooms now is moment seems to be about mixing and matching materials like metal, concrete and wood. I’ve seen some unique elements in ceilings, too. And I’m happy to say that wallpaper is back! I have always loved it.